“Teamwork is essential — it allows you to blame someone else,” as they say. However, we know that working together yields much better results, and running a marketing campaign, which requires planning, choosing a proper strategy, and setting goals and deadlines, is a clear example. But how do you keep up with a fast-paced work schedule? You’re going to need a support tool that can help you plan your activities and collaborate with other campaigners. Now you've got one right here in your daily SEMrush toolkit. Check out our new Marketing Calendar, which you can easily find in our left menu in the ‘Management’ block. As mentioned above, our new tool is used for planning and collaborating on marketing campaigns. You can create your own personal calendar and use ones that have been shared with you as well. 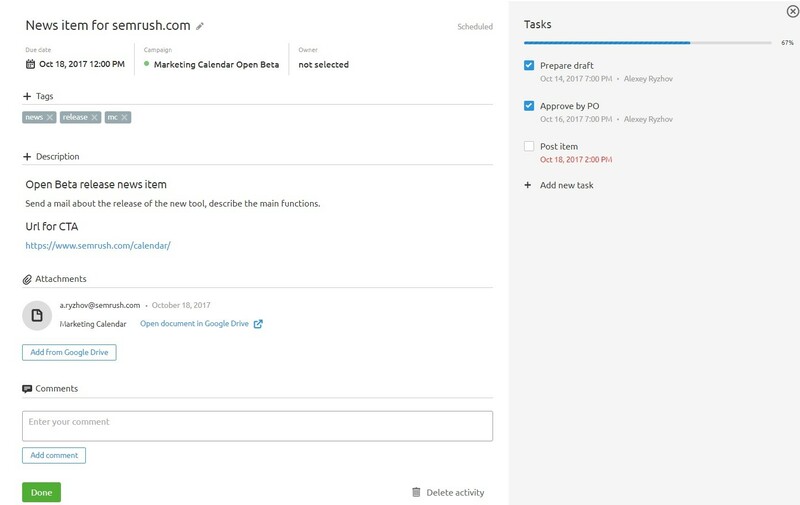 Once you've created a calendar, be sure to add activities and campaigns to work on. An example of an activity might be a newsletter, a webinar, a meetup, a blog post – anything that needs to be done. Campaigns are the higher-level items that will help to cluster your activities by objectives. The Calendar is extremely simple to work with. It saves time and brings a great deal of various handy features and preferences: you can use filters, add tags, attach files from Google Drive, add comments and tasks, appoint responsible persons and set cut-off dates. All changes made by your campaigners are displayed immediately, so you can collaborate in real time without any barriers. A paid account gives you the ability to add an unlimited number of collaborators – you may even have a little party there! There’s no chance of missing important notifications (mentions in comments, approaching deadlines, etc.) – they will instantly show up in the ‘Notifications’ block. 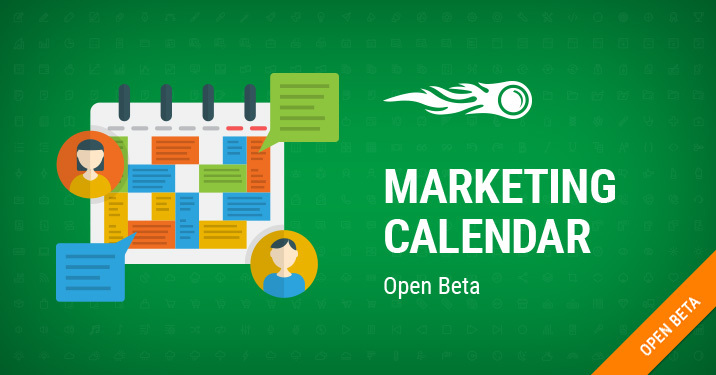 Currently we’re working on integrating the Calendar with other SEMrush tools, so other helpful updates are ahead! In the meantime, be sure to send us your thoughts and suggestions at [email protected].